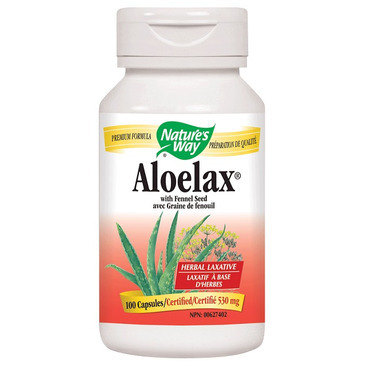 Aloelax by Nature's Way is a gentle laxative formulated with aloe vera, casanthranol, buckthorn bark, and fennel seed. Recommended Dose: Adults take 1 capsule at bedtime with 250 mL of water. Allow 6-12 hours for laxative effect to occur. Note: AloeLax® contains a cathartic herb. Consult a health care practitioner if symptoms persist, if you have a kidney disorder or are taking heart medications. Reduce dose or discontinue use if abdominal cramps, spasms and/or pain occur. Do not use if you are taking thiazide diuretics, corticosteroids, licorice root, or other drugs that may aggravate electrolyte imbalance. Contra-Indications: Do not use if pregnant or breastfeeding. Do not use if you have hemorrhoids or chronic gastrointestinal disorder. I used this for 4 days with no results.